This page shows you how to create an alerting policy for an uptime check. To create, update, and delete your uptime checks, see the Managing Uptime Checks page. You can have up to 100 uptime checks per Workspace. 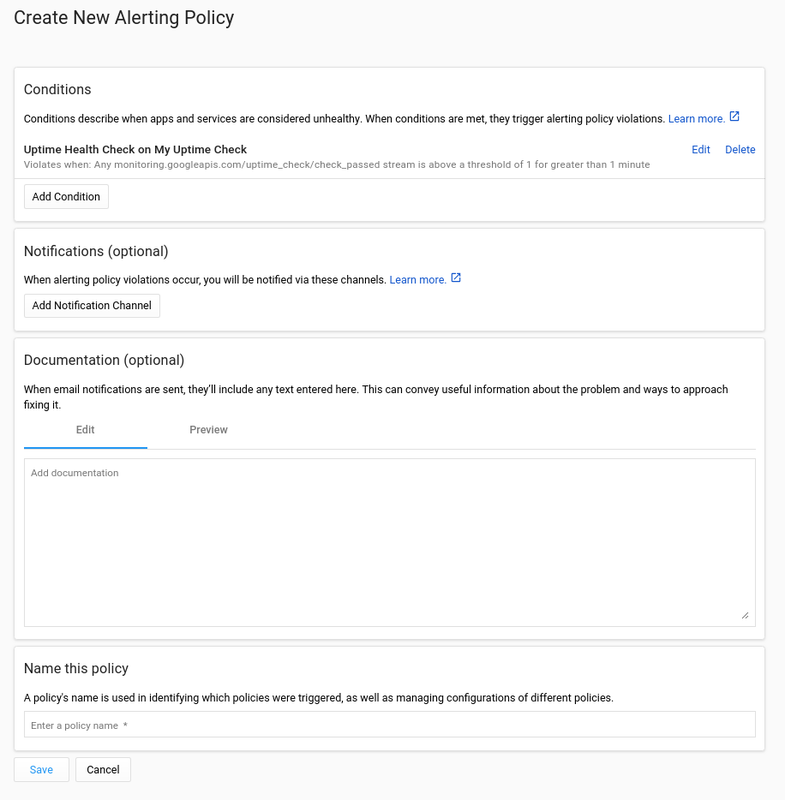 For details about alerting policies, see Introduction to Alerting. 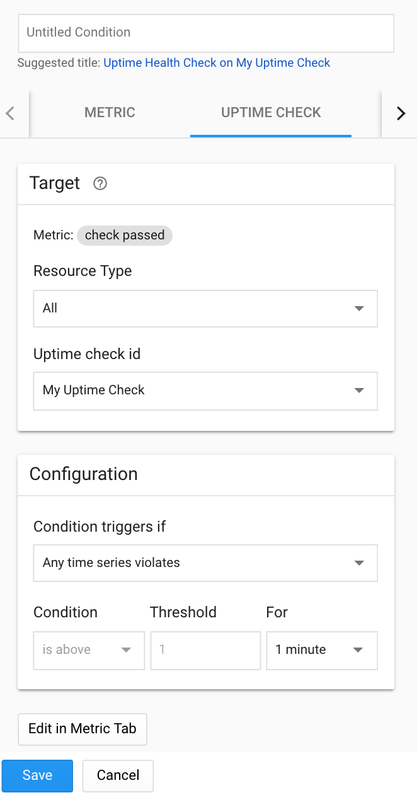 Be sure to create the alerting policy for an uptime check from the Uptime Checks dashboard, as described on this page. Don't use the Alerting dashboard. You can create an alerting policy to notify you when an uptime check fails. Create the uptime check. In this example, the uptime check identifier is My Uptime Check. Uptime Checks Overview, click the More icon, more_vert, and select Create Alerting Policy. Click the Uptime Check tab if it isn't selected. Enter a title for the Condition. The Target and Configuration panes are pre-populated for you. Note: By default, this alerting policy is triggered when 2 or more checked locations don't respond within a 20-minute alignment period. By default, a single location failing won't trigger a notification. To view or modify the default settings, in the Conditions pane shown above, click Edit in Metric Tab. To configure a notification channel, click Add Notification Channel. From the drop-down menu, select your preferred notification channel and enter any channel-specific information. Optionally, enter a notification message in the Documentation pane. Enter a name for your policy. Click Save. After the alerting policy is saved, a summary of the policy is displayed. To edit or delete an alerting policy, from the Alerting > Policies Overview page, click the policy name, and then select Edit or Delete. If you select edit, the Edit alerting policy page appears. From this page, you can edit the condition, notifications, documentation and policy name. After you have completed your modification and saved them, you might need to refresh your Stackdriver console to refresh the alerting policy summary.